A polaroid themed giveaway - closed!! Right now I am (hopefully) sitting on a train to Minehead for ATP curated by Matt Groening! I am so excited! So... as I have no polaroids to share with you today I decided that now would be an awesome time to have a giveaway to celebrate polaroid week and being nice! each winning something from a truly wonderful shop. I must admit I am a teeny bit jealous of the winners already. First up is the lovely Diana with her shop City Light Photography. I have loved Diana's work for almost as long as I have been blogging and I always automatically think of her images when I think of polaroids so I am delighted to include her work in the giveaway! So you can win... Diana's Polaroid Carnival Set which includes 3 gorgeous 5x5 prints of polaroid photos. Next up is Phebe with her creative polaroid prints, I only discovered Phebe's flickr this week through Pugly Pixel but I was instantly smitten and inspired by her sense of fun and adventure especially as I am just now starting to take polaroids of my own. So you can win... an 8 x 10 print of Phebe's delightful Legs in the Sky print. So you can win... An 8 x 10 print of Sarah's beautiful Polaroid 640 in teal. And, last but not least is one of my favourite etsy shops, Cute n Boot. I already own some the pocket books from this shop and I absolutely adore carrying them around in my bag during the day just in case I need to write something down. So you can win... a set of Cute n Boots darling polaroid pocket books portraying a time line of polaroid cameras. The winners for this giveaway have now been announced. Are you excited?? I am! 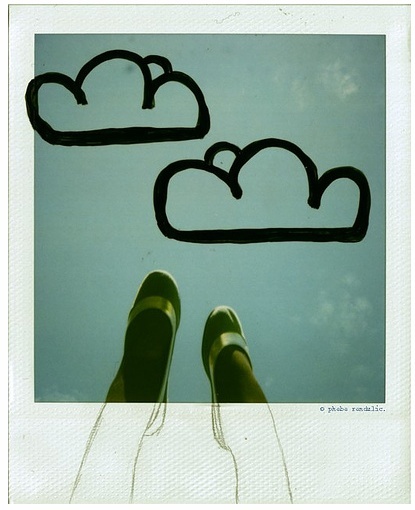 I hope you have all loved Polaroid week not just here but on my tumblr and of course Flickr as well... I already can't wait for next year... I might have some colour polaroids by then!